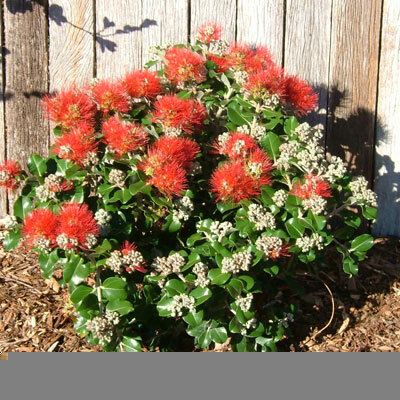 Metrosideros, the New Zealand Christmas bush, is used widely in parks and gardens for specimen plantings, hedges and windbreaks.Grow in a large garden pot with moisture retaining media and you will get a great foliage and flowering effect for your outdoor rooms. Crimson Glory will grow to 3m high and 2m wide if unpruned making it an ideal specimen or windbreak that will become smothered with flowers in season. Red Baby trims easily into a hedge or topiary for decorator pots. It will grow to 2m high and 1.5m wide if unpruned but can be kept to any desired height as a formal hedge when pruned. Grown in a large decorator garden pot with moisture retaining media, Red Baby will give a great foliage effect for your outdoor rooms. Trim to any desired shape to fit your décor. Metrosideros is easy to grow over most of coastal Australia. Plant in sunny well draining garden beds with added humus dug in. Mulch well at planting. Once established little supplementary watering is needed except in extreme dry times. Heavy pruning can be carried out at any time through the summer after the flowering period. At other times, trim only if needed, as you do not want to cut off the developing flowers. Fertilise only during spring and summer with a well balanced mix. Crimson Glory and Red Baby are a selection from an intensive breeding programme by Mr. Terry Keogh of Victoria Point in Queensland. He used crosses of M. collina from Hawaii with M. villosa from the islands of New Zealand and selected from the progeny then back crossed to get the smaller growing varieties as we have in the Firebird series.